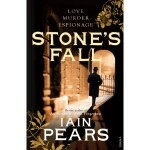 Iain Pears is an author who likes slicing up his books, and dicing up his narrative. Four narrators in his most famous book, An Instance of the Fingerpost; three in his follow-up, the more dense The Dream of Scipio, spanning fifteen centuries. And now Stone’s Fall, relating the mysterious death of a tycoon, John Stone, explained backwards, and refracted through three very different first-person narrative prisms: a simple journalist (Broddick), a complex spy (Court), a romantic magnate (Stone himself). It’s a gripping, enlightening romp through Victorian and Edwardian England and Venice. But forget the period: the book’s exhilerating star – femme fatale, grande horizantale, tantric temptress – is Stone’s widow, Elizabeth. And if you guess the devastating denouement you’re smarter than me.